Slightly edited; originally published under the title "Modi Is Coming to Jerusalem." 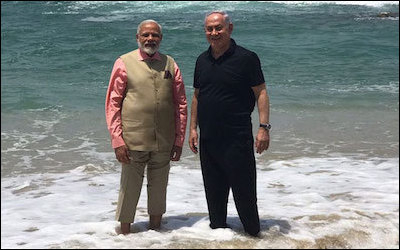 Israeli Prime Minister Benjamin Netanyahu strolls with his Indian counterpart, Narendra Modi, on a beach in Israel on July 6. Notably, Modi's visit was not "balanced" by a visit to the Palestinian Authority. Narendra Modi's July 5-6 visit to Israel, the first-ever by an Indian prime minister, reflects the significant expansion in relations between the two countries that has taken place since the establishment of full diplomatic relations in 1992. Since Modi and the Bharatiya Janata Party (BJP) came to power in May 2014, his administration has shed its predecessors' reservations about regular public discourse regarding India's ties with Israel. It is worthy of note that Modi's trip to Israel was not "balanced" with a visit to the Palestinian Authority, indicating that India has freed its relations with Israel from its historical commitment to the Palestinian issue. Indeed, India has modified its voting pattern at international organizations by refraining to join the automatic majority against Israel. India and Israel display high levels of threat perception and share a common strategic agenda. Both have waged major conventional wars against their neighbors and have experienced low‐intensity conflict and terror, as they are both involved in protracted conflicts characterized by complex ethnic and religious components not always well understood by outsiders. Both face weapons of mass destruction (WMD) in the hands of their rivals. India has freed its relations with Israel from its historic commitment to the Palestinian issue. The two nations share a common threat: radical offshoots of Islam in the greater Middle East. Israel regards parts of the Arab world — Saudi Arabia in particular — as hubs for Islamic extremism, while India views Saudi‐Pakistani relations with suspicion. Moreover, India fears the Pakistani nuclear arsenal might ultimately fall into the hands of Islamic radicals. For Israel, Islamic radicals in the Arab world and in the Islamic Republic of Iran constitute a constant security challenge. This challenge has become more acute as Iran's nuclear potential has grown. The more recent ISIS phenomenon has ramifications beyond the battlefields of Iraq and Syria, as its offshoots threaten the stability of Egypt and Jordan — Israel's neighbors — and are increasingly sources of concern in south and southeast Asia. India has gradually overcome its inhibitions and engaged in security cooperation with Israel. In the wake of diplomatic normalization in 1992, then Indian Defense Minister Sharad Pawar admitted to having already cooperated with Israel on counterterrorism. This cooperation, which involves exchange of information on the finances, recruitment patterns, and training of terrorist groups, is conducted away from the public eye. The November 2008 Mumbai terrorist attacks underscored the need for better counterterrorism preparations in India and elicited greater cooperation with Israeli agencies. 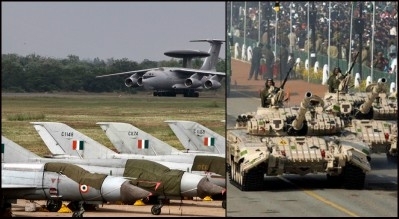 India has relied on Israeli companies to upgrade aging Soviet platforms, such as Mig‐21 fighter jets and T‐72 tanks. Arms supply and technology transfer have become important components in the bilateral relationship. Initially, Russian failure to deliver promised weapons at expected prices and/or schedules led India to turn to Israeli companies to upgrade some of its aging Soviet platforms, such as its Mig‐21s and T‐72 tank fleet. Difficulties in the development of weapons systems at home have led to the purchase of Israeli products and to partnership in developing advanced military technology. New Delhi purchased advanced radar and communications equipment from Israel, as well as portable battlefield radars, hand‐held thermals, night warfare vision equipment, and electronic fences to improve border monitoring. A long list of Israeli military items, such as ammunition, UAV parts, and even missiles (Spike anti‐armor, the Python‐4 air‐to‐air, naval Barak‐8 surface‐to‐air) are being produced in India. Examples of high-end items include the airborne Phalcon radar Airborne Early Warning and Control Systems (AWACS) , which is mounted on the Russian IL‐76 transport aircraft, and the long-range Green Pine radar. The sale of the Phalcon by Israel to India required American approval, which was finally secured in May 2003. India signed a contract for the purchase of two additional Phalcon/IL‐76 AWACS valued at $1 billion during the November 2016 visit of Israel's President Reuven Rivlin to India. Israel was the third‐largest arms supplier to India in the three years ending March 2016. 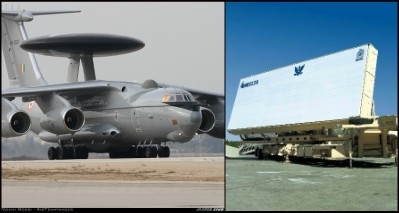 India has purchased high-end defense equipment from Israel, including Phalcon radar Airborne Early Warning and Control Systems (left, mounted on a Russian transport aircraft) and the ground-based missile-defense Green Pine radar (right). In April 2017, India signed a contract worth about $2 billion to procure anti‐tank missiles and air defense systems from the Israel Aerospace Industry (IAI). This was the largest order in Israel's history. One month later, the IAI secured another contract for $630 million to supply Barak‐8 missiles for the Indian Navy. Both deals involve technology transfer and production in India. These deals are part of PM Modi's $250 billion plan to modernize the armed forces by 2025 amid tensions with neighbors China and Pakistan. The Indian‐Israeli nexus has various Indian Ocean implications, particularly in response to China's growing presence. The Indian Ocean, where India is an important actor, has become an area of growing interest for Israel because of its apprehensions about Iran and Pakistan. While India, a major player in the international system, has improved relations with Washington, New Delhi's links with Jerusalem have the potential to smooth over some of the remaining difficulties in dealing with the US. Working with Israel fits into Modi's plan to deepen relations with the US given the US‐Israel friendship. New Delhi believes improving relations with Israel has had a positive effect on the U.S. disposition toward India. New Delhi believes its normalization of relations with Israel in 1992 had a positive effect on the American disposition toward India. The often‐exaggerated power of the Jewish lobby in America was appreciated in New Delhi. In the 1990s, the American Jewish organizations valued the importance of India for the US and for Israel, as well as the potential advantages of nurturing good relations with the Indian community in America, whose congressional power is on the rise. Many members of the Indian lobby, the US‐India Political Action Committee (USINPAC), which was formed in September 2002, expressed the desire to emulate American Jewish groups and showed interest in cooperation. The Jewish and Indian lobbies worked together to gain the Bush administration's approval for Israel's sale of the Phalcon to India. Moreover, in July 2003, they were successful in adding an amendment to a bill giving aid to Pakistan that called on Islamabad to stop Islamic militants from crossing into India and to prevent the spread of WMD. In the fall of 2008, Jewish support was important in passing through the US Congress the US‐India nuclear deal, which allowed India access to nuclear technology for civilian use despite its not being a party to the Non‐Proliferation Treaty (NPT). The decline of the US and the rise of China have strengthened the strategic glue between India and Israel. Two strategic developments of the 21st century are likely to strengthen the strategic glue between India and Israel: the decline of the US and the rise of China. In the Middle East, the Obama administration projected weakness and encouraged Iran's quest for hegemony. US weakness is inevitably having ripple effects in other parts of the globe. Indeed, Asian states view the declining American role with concern. It is not clear whether new American president Donald Trump will adopt a more assertive foreign policy than that of his predecessor. Nor is it known how he will go about confronting China, as he displayed isolationist impulses during his election campaign. India and Israel represent two ancient civilizations. They share a British colonial past and were the first to become independent (in 1947 and 1948, respectively) in the post‐WWII decolonization wave. Both were born as the result of messy partitions and have maintained democratic regimes under adverse conditions ever since. Nevertheless, it took over four decades to establish a fruitful bilateral relationship. For Israel, good relations with India reflect awareness of structural changes in the international system as the center of gravity moves to Asia and the Pacific Rim. India is an extremely important protagonist that requires Israel's utmost attention.